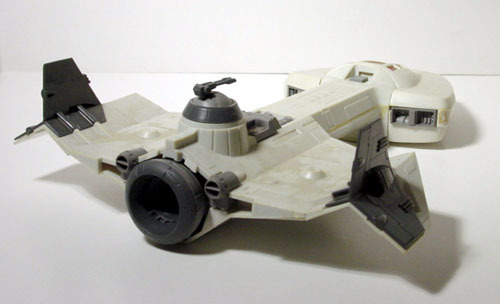 For those keeping score, the coolest 70s toy ever was the Mattel Space: 1999 Eagle Transporter. The second-coolest toy of the Space: 1970 era was Kenner's 18" Alien. The third was Kenner's Bionic Bigfoot from The Six Million Dollar Man, and the fourth was Mego's Star Trek Communicators. 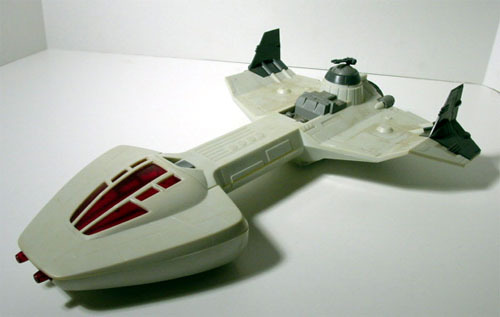 I loved my Star Wars figures and ships, but the Star Bird was probably my single most favorite toy. What you don't mention is the modular design. Those black tail fins slid off and were actually interceptors that could be played with by themselves. The cockpit section popped off, and the rear main engine slid out. Then you could combine the cockpit and engine to make a smaller shuttle-type vehicle. Heck, the outer shell of the cockpit section slid off as well, leading to another configuration. Reminds me of the Enterprise-D's detachable saucer section. So, this would sit higher on my list of coolest toys ever! Thanks for the memory. I agree the star bird was one of the best toys I have ever had growing up!! I am now 40 and I just pulled out my star bird and my X-wing fighter (star wars) and I was comparing the two and I would have to say my star bird is a cooler toy than my X-fighter. I still remember putting it together on Christmas and hearing the cool engine sounds. I am now cleaning both toys up and thinking about selling both of them. Anyone interested let me know. Wow, I'd never heard of the black version before. Way cool! That was an epic one, no doubt. I still had the main body (minus the wingtips and turret) into the early 90s. I also had the full base. It was cardboard, but it had a working crane and docking points for the wingtip "fighters". I got Star Bird for Christmas one year and instantly fell in love with it. It's a great toy. I wish I had the Avenger or even the playset but I had plenty of adventures with Star Bird. The Space: 1999 Eagle was used as the Millennium Falcon for my Star Wars figs until I actually got one. Christopher I agree that the Mattel Eagle Transporter was the coolest '70s toy. I got it as a boy in '76 and still have it today. I didn't know I wanted this until my dad got it for me for Christmas one year. It became my favorite Christmas present and one of my all-time favorite toys ever. I got the base later and had a lot of fun with it, too. I never did get the smaller versions though. I always thought it looked like it would fit right in to a Space:1999 show. Wish I still had it. The coolest one, for sure. The sound of the engine rocketing the sky or landing stimulated so many adventures. And I still have it! Now it is without the guns at the turret and I have to repair the damage done by a forgotten battery, but it is still in pretty good shape. One thing that always annoyed me was the difference in scale between the cockpit and the second half of the ship, especially the interceptors. But it nevertheless was a wonderful toy I thought I was the only owner, as in Spain it was not that common (I got it through my French Grandpa). Thank you for breaking this loneliness! The only thing that gave away the difference in scale was if you looked closely at the cockpit sticker under the red canopy. I used to ignore the sticker and pretend it was a capital ship that could launch interceptors, the red canopy covering the bridge of the ship. Agreed, best original sci-fi toy of the seventies......... loved it as a kid! A couple of those pictures are from my Starbird´s box and my own Intruder. Probably - I'm not sure where they originated as they were e-mailed to me. Hope it's okay that I used them. Not only was the Star Bird a fantastic toy, it could be used as an instrument in experimental analogue porta studio electronic music! I loved this. As much as I loved my toys that were based on TV/Movie franchises (Star Trek, Space 1999, Star Wars in particular), my favourite toys were the ones that let me tell the story like the Star Bird or my all time fave the Micronauts. Yes, Star Bird ranks up there, and the Micronauts have to rank high as well. Another wonderful offering from MB Electronics with a similar theme was the programmable crawler, Big Trak. Yes,please, an entry (in fact they deserve a whole serie) for Micronauts!! Commander Arcturus Rann the Space Glider, Acroyear, the Time Travelers... And I even had a (thanks google) Galactic Cruiser! Please one entry for them!!! You're not going to believe this,but I swear it's true.Last month while taking Christmas stuff down from the attic,I came across a "Mystery Box".Now, I'm fully aware that I stashed old toys from my childhood and they've traveled with me over the years,but I had no idea what a surprise this box would contain:A Starbird,a Big Trak, ROM the Space Knight,and a Fat Wheels R/C jeep.After putting batteries in all 4 I was STUNNED to find they all worked perfectly!They all went under my tree for the holiday season,and delighted everyone except my daughter who dismissed them as "boy toys".I'm guessing they were all Christmas'79 or '80 gifts and I also remember getting ALIEN so he must be lurking in the rafters somewhere! The Star Bird was a great toy, amazingly well-designed and executed (and pretty sturdy, if I recall). You can see the Star Wars influences, but it is its own thing, without it merely being a cheap ripoff. Also, the cover art reminds me of Alex Ross! 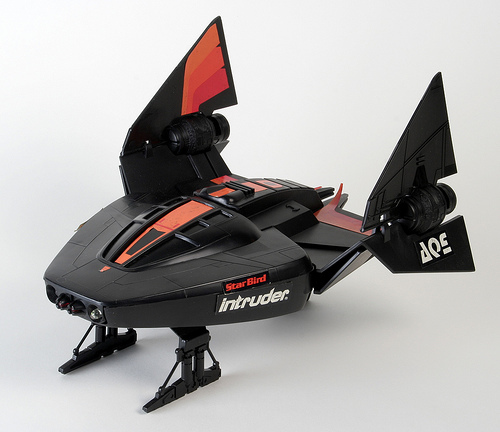 My friend had the Starbird Avenger (the 2nd version) and for Christmas that year I asked for the Intruder. The two ships were able to interact to a degree, because they had infrared sensors built in. This made for great mock-battles. When hit, my Intruder would simulate engine distress. I wanted one of these SO BAD when I was little. Other cool space toys nobody's mentioned were the Enterprise bridge playset (with the spinning transporter) and those generic spacemen sets with the plastic astronauts. My brother had the complete Fireball XL5 set. Sadly, it is no longer complete! I had this guy too- in the "Avenger" configuration. Same toy, just different stickers. Lots of fun. The toy reminded me of the rare South Bend Electronic Enterprise released around the time STTMP came out. I had that one too, and was the envy of my friends. You could take it apart and create other Federation ships with it, like a "Scout" and a USS Reliant-looking ship from STTWoK. Very cool toy. although sadly, they weren't motion controlled. Although it wasn't entirely accurate ( having been based on drawings of the filming model before all the details were finalized ) it was fairly close. Also it was unique for an Enterprise toy in that the saucer, engineering hull, nacelles and struts were modular, and could be assembled into different craft ( some of which were based on the designs in Franz Joseph's "Starfleet Technical Manual" ). They are fairly rare nowadays and ones that are complete and in good shape fetch some high prices on Ebay. If you see one in action I think you'll agree it also deserves a place on the 'coolest toys' list. Are you the "Dep1701" who commented on the review? I had no idea that Milton Bradley was affiliated with South Bend. When I got my Electronic Enterprise I'd never heard of South Bend before, and imagined that I had a rare find. I think my mom ordered it from a JC Penney Spring catalog and I really had no idea what I was getting (I think I received the toy around Easter 1980). This was probably the last of my childhood toys that I parted with. A young cousin spotted it on a shelf in my closet circa 1995 and literally begged me for it, and I foolishly gave it away. It was still in decent shape but the seams were beginning to yellow where the toy had been glued together (similar to my Mattel Eagle 1) and the stickers were a bit yellowed also. Fantastic toy. At the time it was the ONLY Enterprise refit toy around, and prolly the only Enterprise toy I'd ever laid eyes on. Hi Hank, sorry for the long wait to reply ( i didn't check back! ). Yes, that was me who commented on that video. I'm missing a few parts from my Star Bird, but it still "flies". Such an awesome toy! I bought one mint in box for....$395.00...yikes....but worth it.I also loved the Micronauts.Been buying those too.Was never a Star Wars fan but Battlestar Galactica and Space:1999....oh yeah! The Star Bird was one of my most memorable Christmas gifts. Second only to my Mego Star Trek Bridge play-set. Tragically lost both in a house fire. Played with the Star Bird for hours. Don't make toys like this anymore. Except for the Bigfoot (the only Six-Million Dollar Man toy I didn't have), I certainly can't argue with that top 5...except that there were just too many fantastic toys of the era. I loved that (huge) Alien, but sadly, I feel I didn't appreciate it then as I would now. At least I *played* with my toys. I would've put my Micronauts in that last over the Bigfoot, perhaps. Oh, and I just about flipped my lid when I cane across the Interplanetary UFO Mystery Ship in a store recently. The glow-in-the-dark version no less! 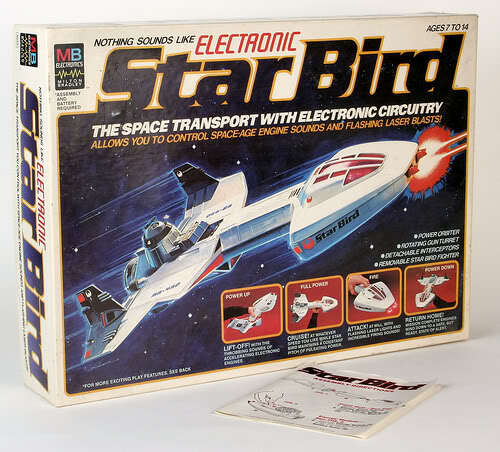 I had both the "Star Bird" and "Intruder" growing up (Didn't have the command base). It was the first "Laser Tag" toys. I loved that they could shoot at each other via the transmit and receive LEDs on the front and they would make a sound when one was hit. Great toy, way before their time. I used to love these toys! I had one Christmas morning 1979! I was 8 years old and it was and still is the coolest toy ever! Well, I've just had one delivered today, brand new (old stock!) still in cellophane, never opened. Its a Spanish one but still the same original Star Bird. I am going to put the opening and review on YouTube soon. Where has it been for the last 35 years or so?!!! Feel like that kid on Christmas morning again! I would love to see these toys come back, and buy them. The Star Bird is pretty much my favorite toy ever from my childhood, rivaled only by my Atari 2600. I actually had the Intruder & my friend had the Avenger, so, naturally I was the Empire & he was the Rebel Alliance. Good times for sure! Friday Night is Super Hero Night on CBS! A Birthday Blast for Buck! News: UFO Movie in 2013?